Does your room need a Total Sonic Makeover? This is the place to start. Between the UK, USA and Japan, it's hard to tell who has made the most items to decorate your house. Home decor items tend to be on a larger scale then say, bendy figures, so these may run a bit more money when you do find them. But if you're making up a Sonic Room, you can't do without the interesting things on this page. 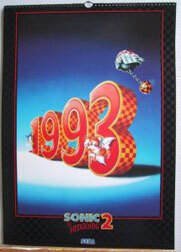 A large Sonic Poster with classic art, and a hanging wall calander for 1993. The poster is quite large, 22 x 34 inches. This is larger than most bootleggers can produce. Unfotunatly it is quite plain. The calander is unusual, in that Tails has a more prominint position (hopping out of the 3) You can barely see Sonic hiding behind the 1. And here comes Eggman to bring us even more much-needed chekcered-patterns. It is unknown what the calander features for the inside pages. It is spiral bound. A Sonic Air-Chair! This is an inflatable chair to sit on while you play Sonic video games. Inflatable chairs were a sort of fad in the previous century, and this one's trying to make a comeback. Somewhat impractical, you can only sit on it if you weigh less than 100 lbs. I also own this, it is still in the box. Giant Sega Dreamcast Home Console Arcade Unit! Just can't fill that extra space in the mansion? Here is an interesting mish-mash console arcade unit. Look at the side, it has the Saturn symbol. Look at the controllers, they're clearly Dreamcast. The design on the front is 3D Blast Sonic. Who put this thing together? Perhaps the yellow part can be made to contain the Sega Console of your choice? Even so, it requires much standing around to play, and lots of space. Analog Alarm Clock/Radio. This one is legit. It was available at Sears in the late 1990s. I own this as well, but without the box as I bought the shelf model, being the last one they had. A Big, bright primary clock with snooze button and glowing hands. The raido is fair. 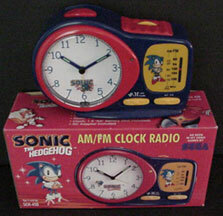 Notice that the second-hand has a little Sonic on it who ticks around the dial. A simple mug with primary colors. Mugs count as 'household goods', so why not collect this mug from 1991? The art may not be as stylish as some of the Japanese mugs, but at least the USA was putting forth an effort. A nice poster for your wall with Sonic & Tails the "Cool Dudes". This has an almost 80s' look. It's slightly altered Stock art, but still nice to see. 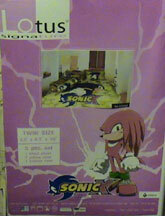 Sonic Adventure 1 Wall Scrolls. These are large 28.5 x 40 inches pieces of cloth. It has 2 plastic bars to hold it streight. 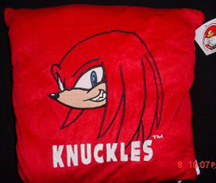 When Sonic Adventure 1 was released, there were 4 or 5 of these made, each equal in size and quality. 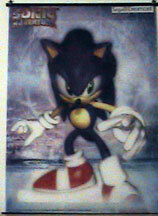 The first is in SonicGear's personal collection! You can see the Dreamcast logo in the corner, proving it is official. Sonic Is there another scroll? They are highly reccommended, due to great graphics and awesome quality! They have become uncommon. The two photos to the right are by Hogger_The_Hedgehog. This is a promo-item, rather than a dedicated poster. 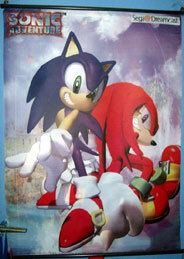 It is for SonicRiders, and came from Nintendo Power, so may be a pull-out or a pack-in item with the magazine. 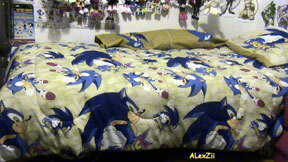 Here is a bed spread with Sonic streaking across a night-sky/outer space background. This MAY have been released in America, but it is known to have been in the UK. This has matching pillows. Dust-ruffle/curtain status is unknown. This is what the Sheets-Set looks like MIP. It's vintage, so the packing is now rare. Note it is pictured with the above comforter /blanket that is NOT included. This cloth is from another, different sheet set. It is less common than the one's above (and slightly tacky-er) This was made in 1994, and could be found at Macon which is in Georgia USA. Did this have a bedspread to match? 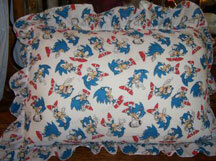 Sonic X pillow cases mean Sonic theme beds can once again be made! 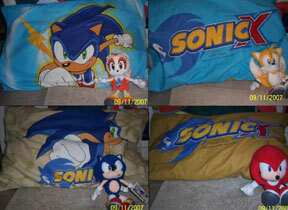 It's great to see that in 2007, they are making more Sonic household goods. There are 2 different types, one with the 'jump punch' Sonic X stock art that someone has added a random lightening bolt to, and an 'away' facing one. Both styles share a logo for the back of the case. The 2nd set is an unusually tan/brown color with sort of stain-like blotches on it. Not sure why they chose something to look like spills or stains for a pillow case, but, there it is. With 2 different sets of pillow cases, a sheets set can't be far behind! Stay tuned for more photos. Photo credit: Zenkai Kenny. WHERE are these coming from? They are NOT made in the USA, and are usually only avilable for over $60.00USD each on Ebay. This is the 'whole set' to the blue pillow cases you see above. As you can see here, if you obtian everything (an expensive proposition) you'll have 2 regular pillow cases, a tube pillow, sheet, and the comforter/bedspread. Each one has the leaping punch Sonic, with a yellow aura around it. It looks like this will go onto a twin bed. The design is not too busy, but it isn't original or 'something different' either. 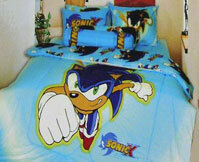 Still, who wouldn't want something like this to help finish their Sonic Room? 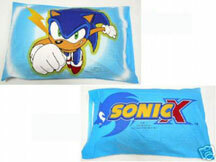 The other side has just 1 large 'looking back' Sonic, with the Sonic X logo. The mottled brown/tan here goes with the darker side of the pillow case, as seen in the photo. 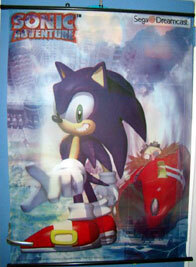 This Sonic X wall scroll looks fast! 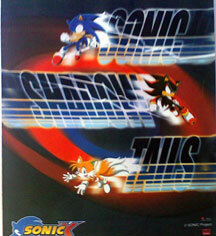 Sonic, Shadow, and Tails seem to be zooming by their names on this wall scroll. With an unusual dark background, the characters really stand out, despite the speed blur effect. You can see the "Sonic Project" logo in the bottom corner, as well as the Sonic X logo, which is a bit large for a non-design element on something like this, but it is still an innovative design and not something we've seen a zillion times. There is supposed to be a coloring error on one of Sonic's hands. However, you can't see it in this photo. Is it on all scrolls?